The I-95 North Welcome Center released their own Roanoke Valley rockfish as part of their Tourism Day Celebration in May a few years ago during National Tourism Week. 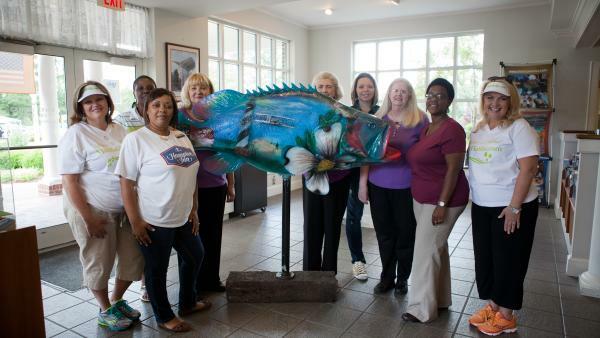 The Welcome Center fish was designed and painted by local artist Harold Evans of Weldon. The fish was airbrushed with North Carolina's significant state symbols, such as the dogwood, cardinal, Cape Hatteras, Wright Brothers, and more, making it ideal for the welcome center. North Carolina's I-95 North Welcome Center is the busiest welcome center in the state. North Carolina has a total of nine welcome centers and nine visitor centers. In 2011, more than 1.5 million travelers stopped at the I-95 North Welcome Center for information. The facility opened in 1968 and was renovated in 1995. The I-95 North Welcome Center offers restrooms, public picnic areas, outdoor grills, drinking fountains, vending and pet areas. The facility is managed by Frieda Day with six other travel counselors. Find more information on traveling in North Carolina at VisitNC.com.